I love visiting historic locations where famous (or infamous) events took place. I recently watched The Conspirator which is based on Dr. Kate Clifford Larson’s book The Assassin’s Accomplice. 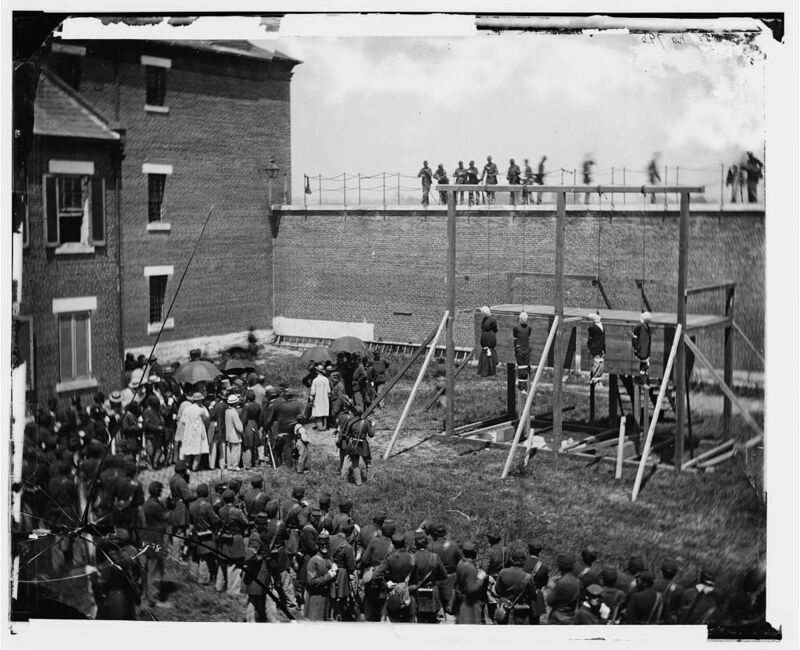 The movie follows the trial of Mary Surratt, the owner of the boarding house in Washington, DC where Booth and other conspirators plotted to kidnap President Lincoln, but then Booth changed the plan to murder. Mary Surratt was arrested two days after President Lincoln died. She and her co-defendants were tried by military tribunal rather than in civil court. She was the first woman executed by the Federal government and the facts surrounding her trial and execution remain controversial. 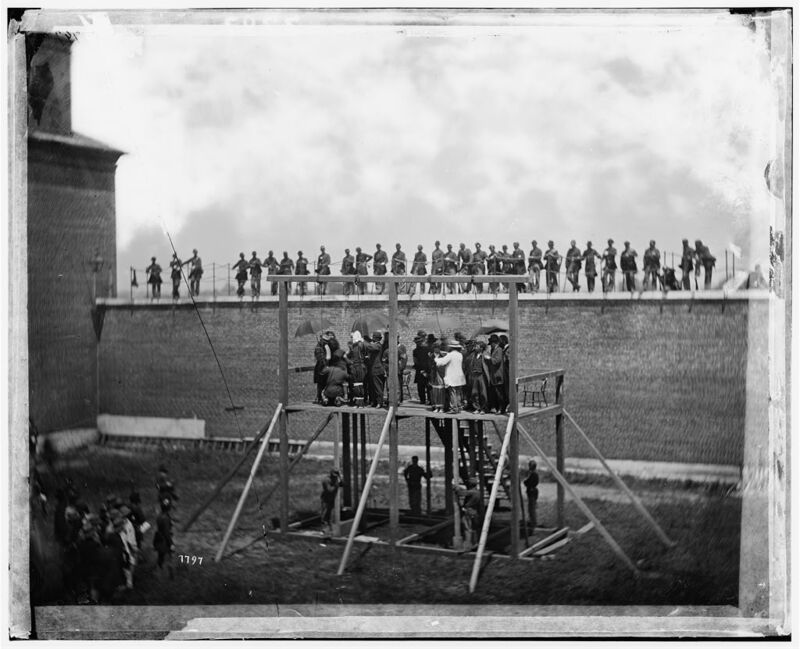 She and three others were hanged on July 7, 1865. Robert Redford did a fabulous job as the director of this movie and it was produced by The American Film Company which uses historians to assure their films depict the events accurately. I’m usually so disappointed with movies and TV shows that play fast and loose with historical facts. The main actors, James McAvoy (from X-Men) and Robin Wright (House of Cards) are fantastic. I didn’t recognize Robin Wright at first ~ she played the role of Mary Surratt so well. It’s a courtroom drama and the movie drags on a bit at times but for the historical accuracy, I highly recommend it. 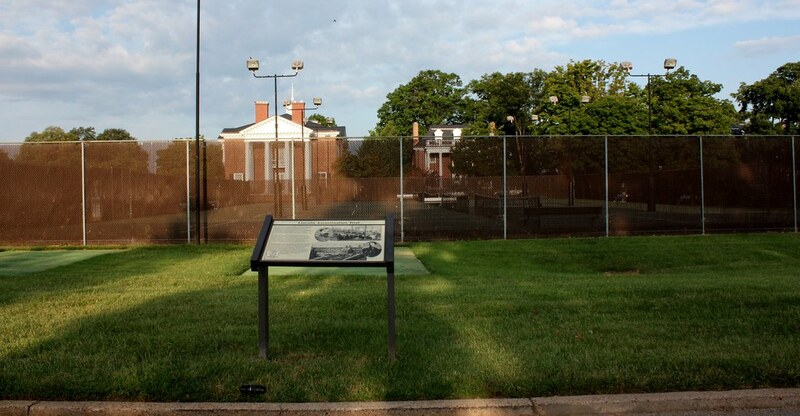 The site of the execution is now tennis courts at Fort McNair. John asked if I wanted to play some tennis there but the thought of that was too macabre for me. I remember those photos from a book I read in HS! But did not know the Fort McNair part of the story. What do you think about the fact that the site of the hangings is now a tennis court? Best of not glorify those who played a part in the events that led to the death of the President? OR Should history have been preserved? This is really interesting. I had no idea that Fort McNair has this story as part of its history. Very nice essay. Thanks! I had no idea either ~ was I ever surprised to find tennis courts where the gallows used to be. It was an excellent movie I agree.